Hey all! Joe here to take a look at a piece that's a little quirky and a little older. 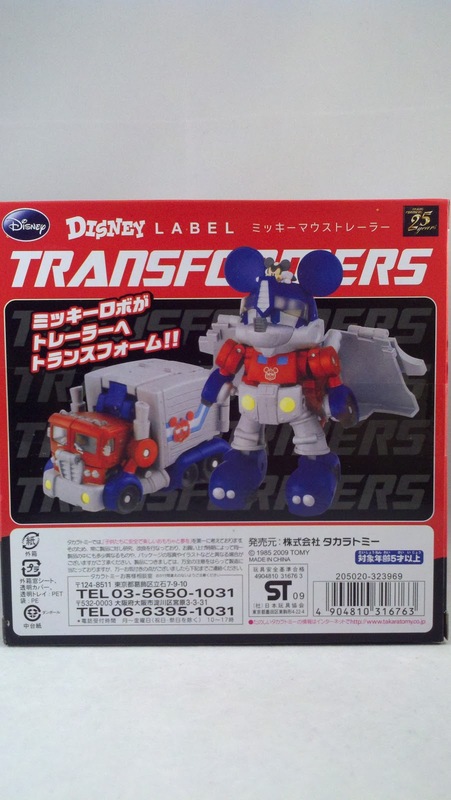 Back in 2009 Takara introduced the Disney Label Transformers; their first offering was a Mickey Mouse themed Optimus Prime. 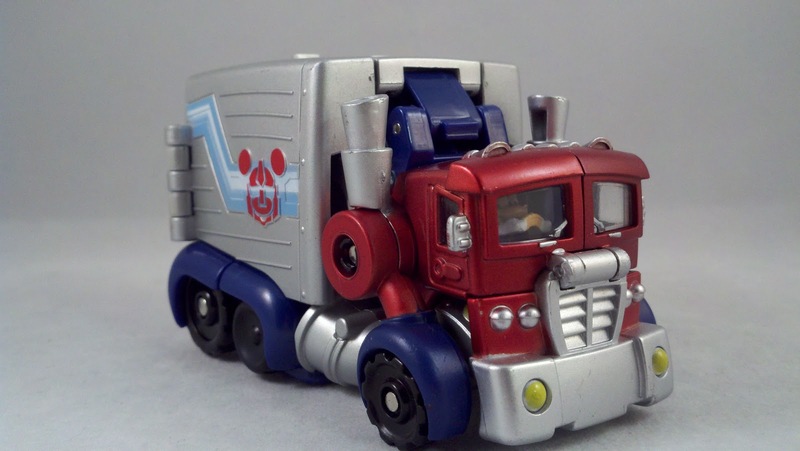 Well... if you've read enough of my posts, you know I'm an Optimus fanatic. I had to get my hands on this. 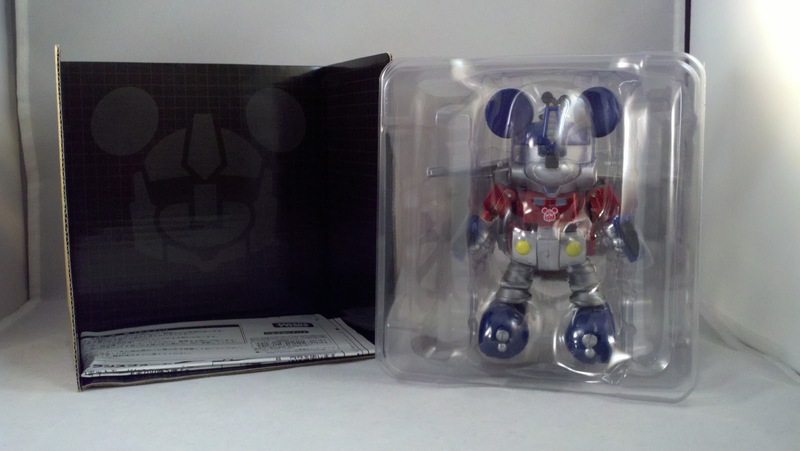 I had my chance at Botcon in 2009; one of the many on-line retailers that had a booth had these on hand and I was able to pick up both versions... and metallic, colored version and a black and white version. 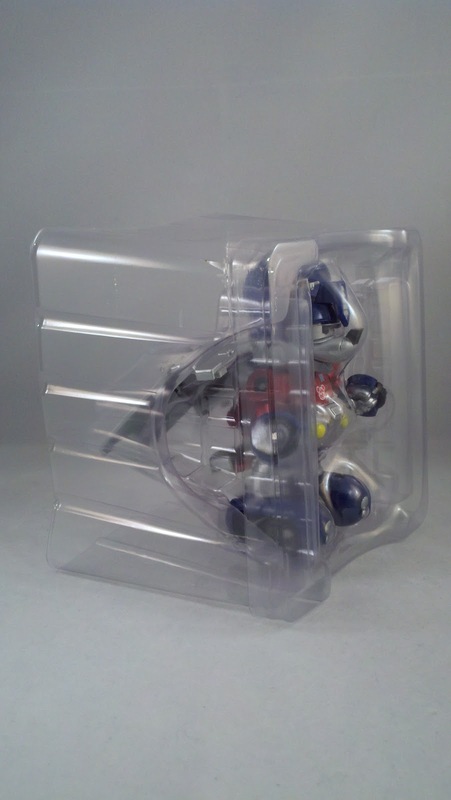 Both have remained sealed to this point and it wasn't until a recent trip to a toy show that I was able to get another that I could happily open. Was it worth the wait? Take a peek after the jump! 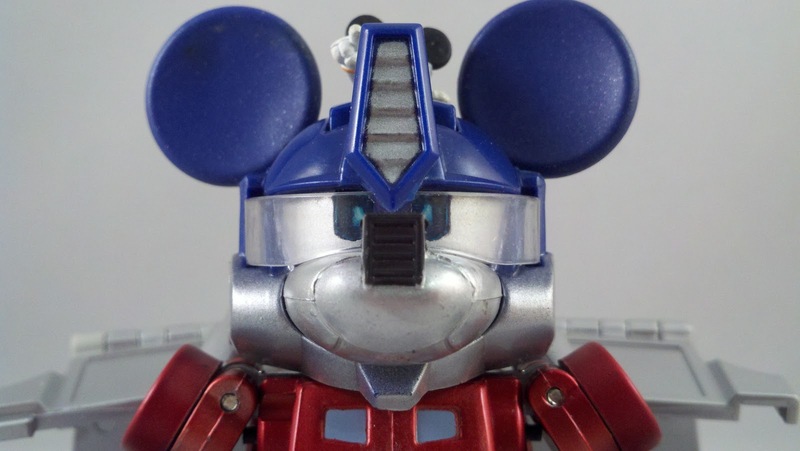 Mickey Mouse and Optimus Prime? Who would have thought? 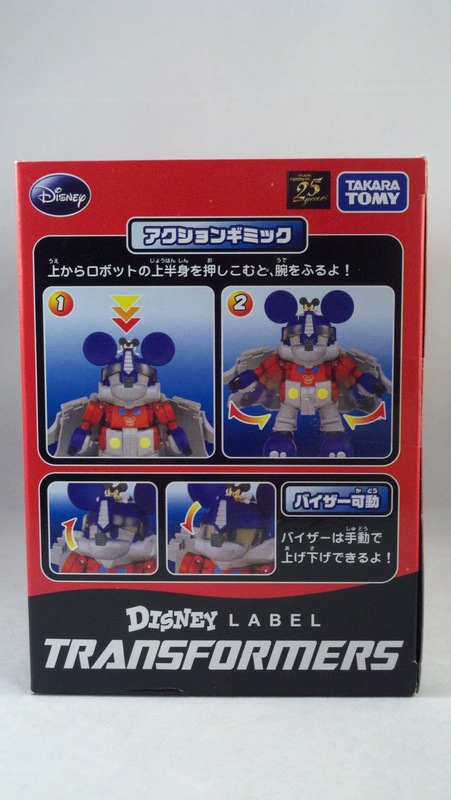 Takara came out of nowhere with this guy; I was certainly surprised. 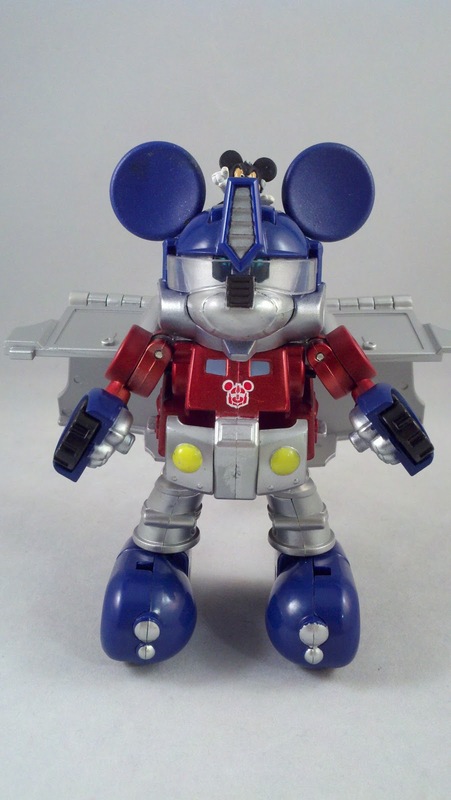 But of course, Disney has a hand in everything, so why not Transformers? 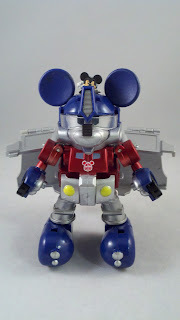 So apparently in collaboration.. Optimus Prime was 'Disney-ized'. 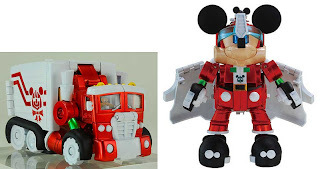 Or was Mickey transformed? No matter. 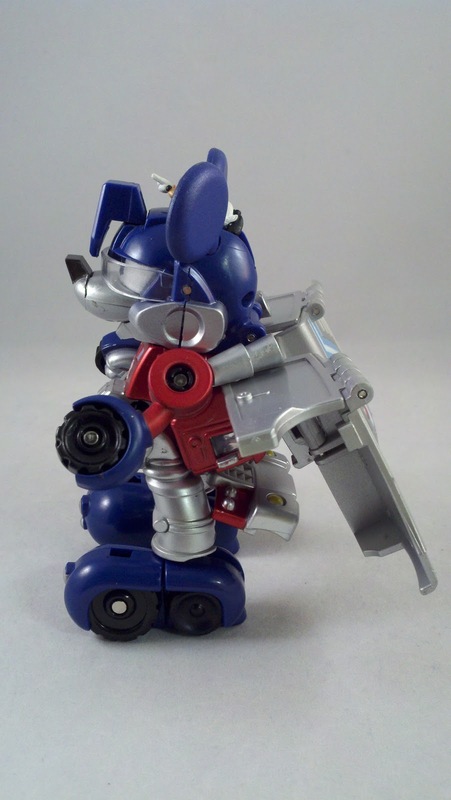 It's a quirky, niche figure that looks decent for what it is. 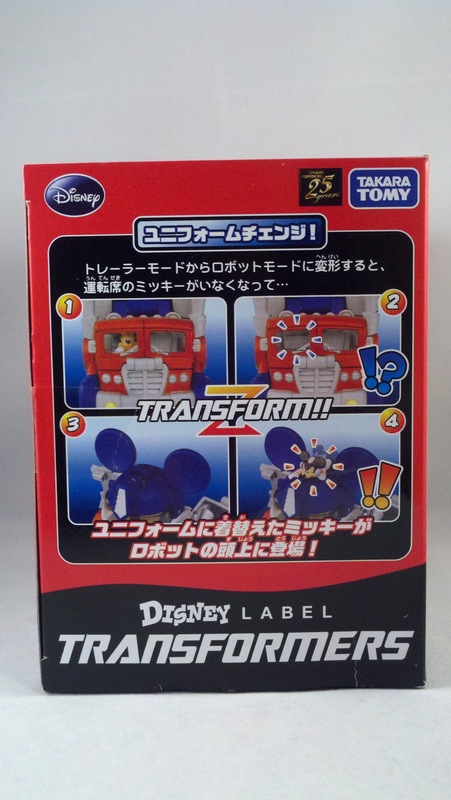 The Mickey Mouse Trailer... as it's called... not Mickey Prime or Optimus Mouse or any other combination of those words... comes packed in a window box adorned with all manner of pictures and text (that I sure has hell can't read). The front gives us a nice view of the figure itself along with some art shots of it transforming. 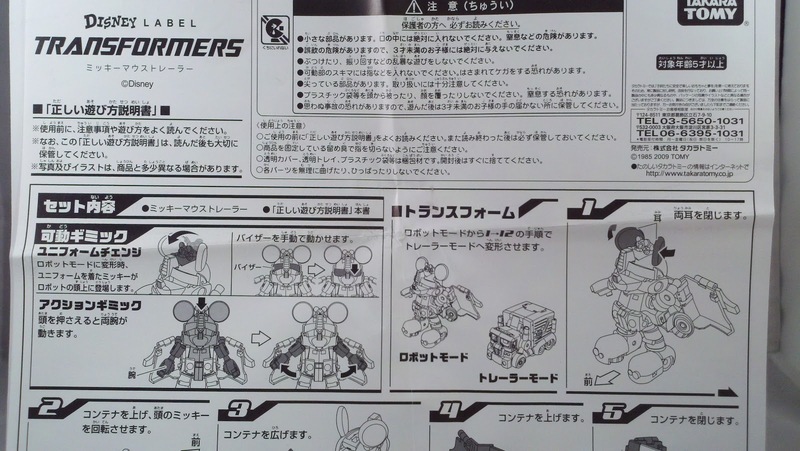 The back gives us shots of the figure in both Mouse-Bot and Alt-modes. The sides go over all the features that the figure has... again, I can't read Japanese, so it's a guess as to what they mean. Taking the figure out of its tray... my first impression... its light... not too bulky... but some of the paint apps leave a little to be desired. 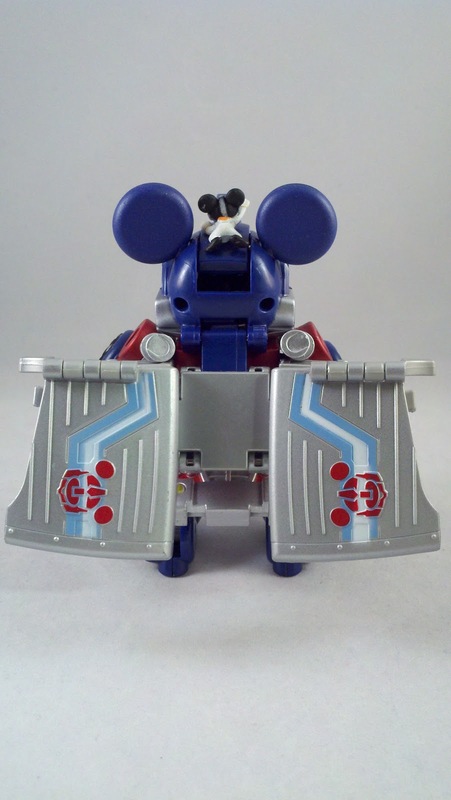 He's definitely Mickey with his proportions and shape. 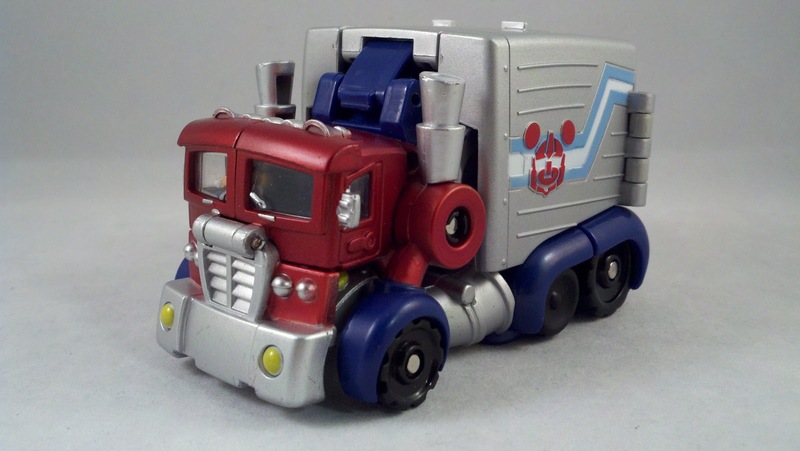 The Trailer of the truck is definitely kibble... so much so that it might as well be wings on his back. 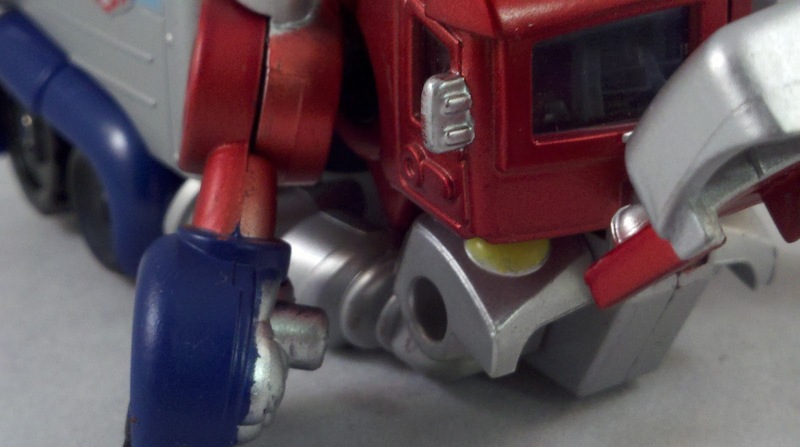 The articulation is next to none. 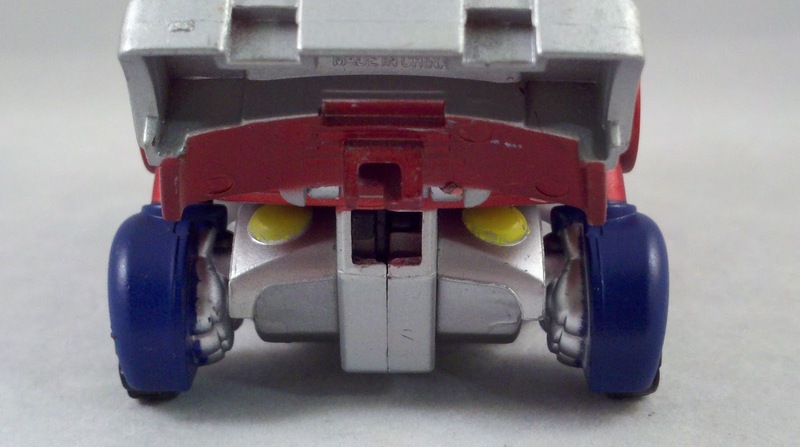 There are swivels at the shoulders and hinges in the feet, but most of that is for transformation purposes. 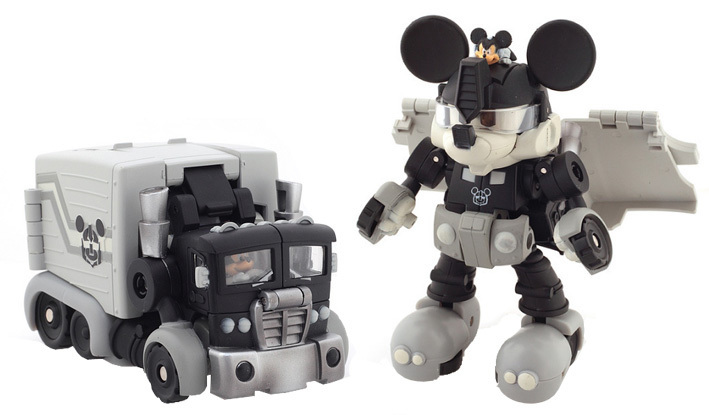 Mickey will either just be standing there or in Alt-mode. 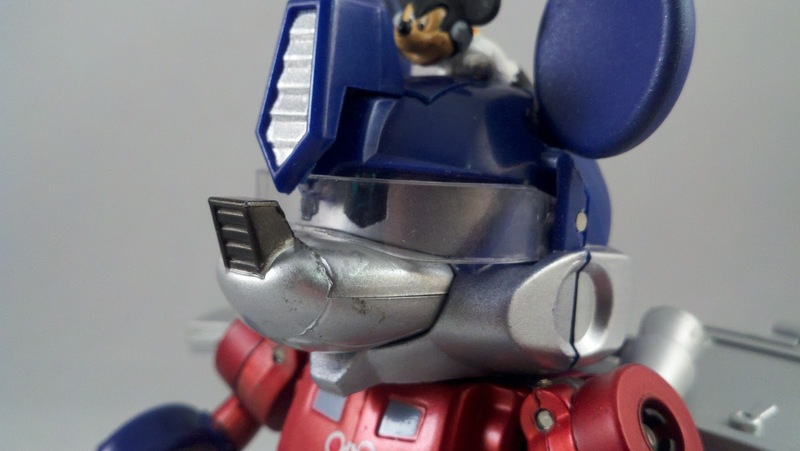 In Bot-mode, Mickey has a few gimmicks that are spring loaded. 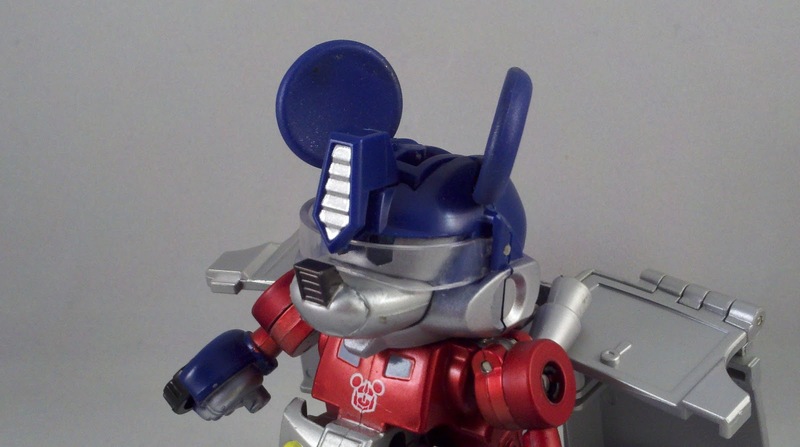 During transformation, a little pilot Mickey flips into place on top of the head. If you press the body down, the 'wings' flap. 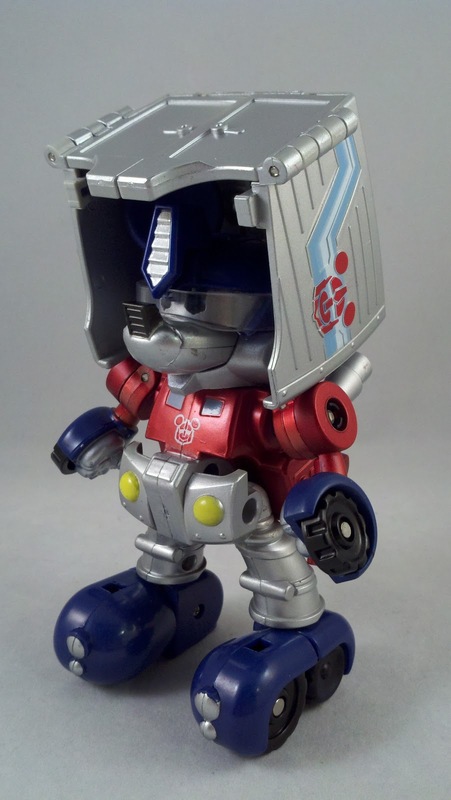 And he has a moving visor. Transforming Mickey is rather easy. Most of the transformation is in the trailer. 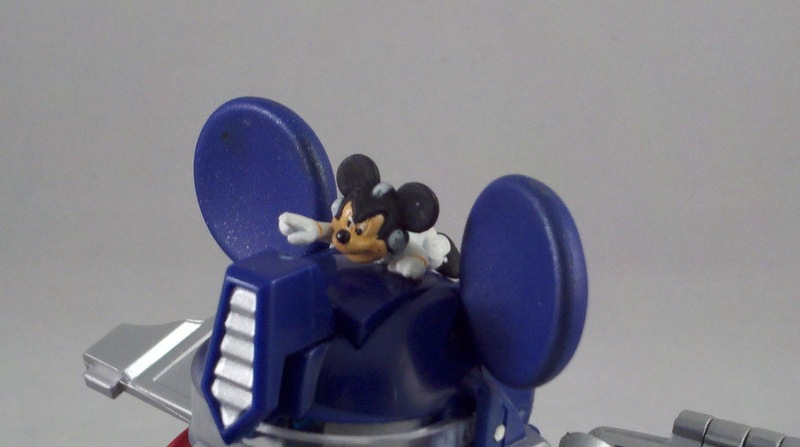 Start by folding Mickey's ears in. 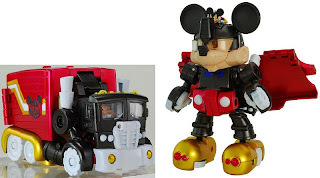 Open the trailer up and then rotate it up to Mickey's head. 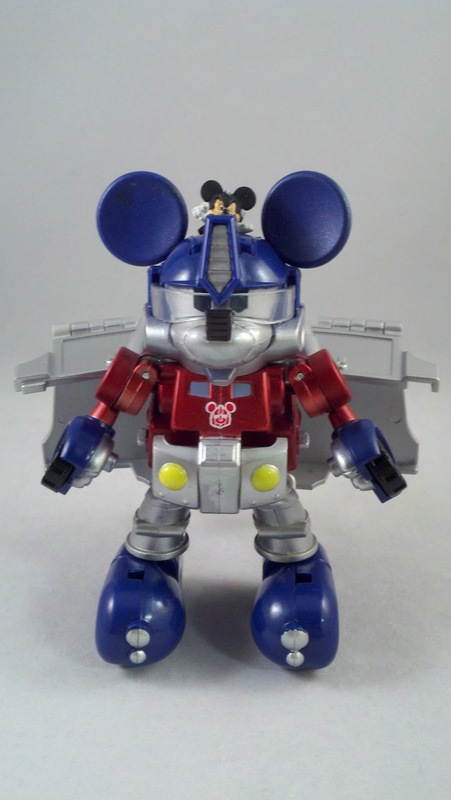 The little pilot Mickey is spring loaded to rotate into the Bot's head. Complete the trailer transformation my folding it all together. 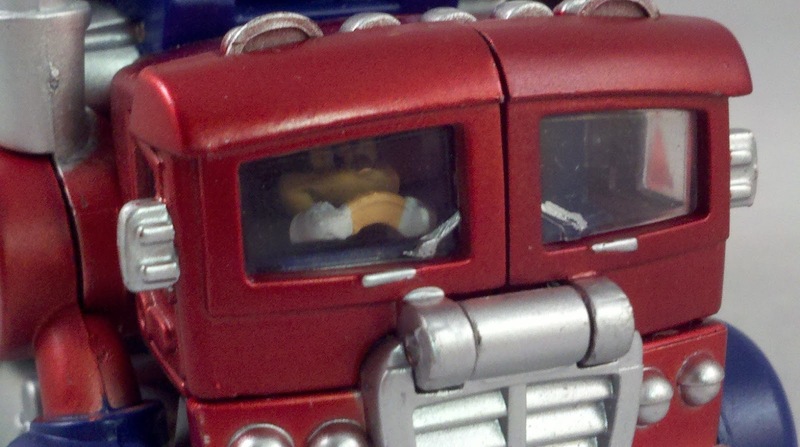 Rotate Mickey's feet inward, making the headlights that adorn them line up horizontally. Fold them down at the ankles and then basically, fold Mickey in half. 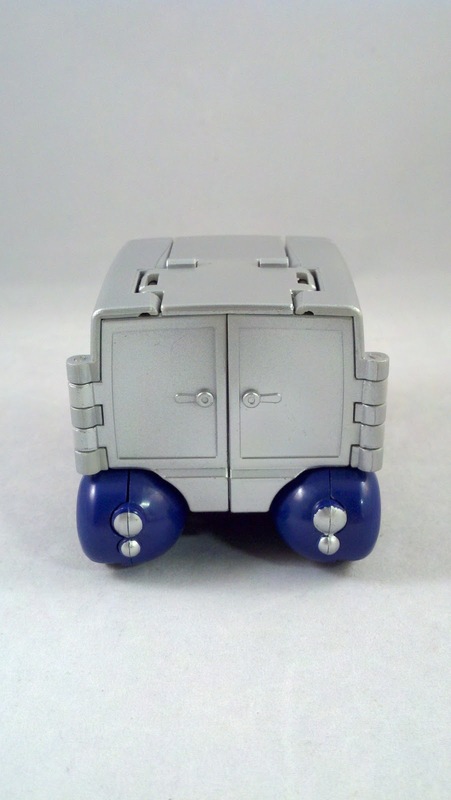 There are two tabs on the trailer that will click into place on the feet. The arms merely push into the sides. There are two posts that pop into holes on both sides of the waist. The final piece is the grill. This has a nice little gimmick built into it. 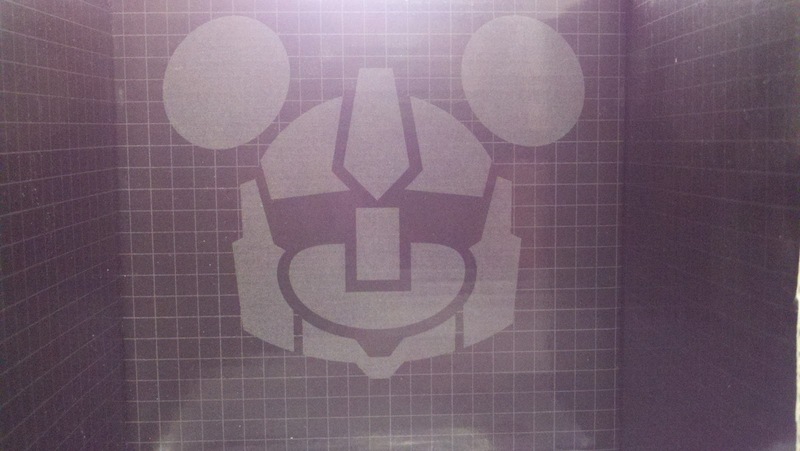 As you fold the grill down to form the front of the truck, a little Mickey pops into place on the driver's side. 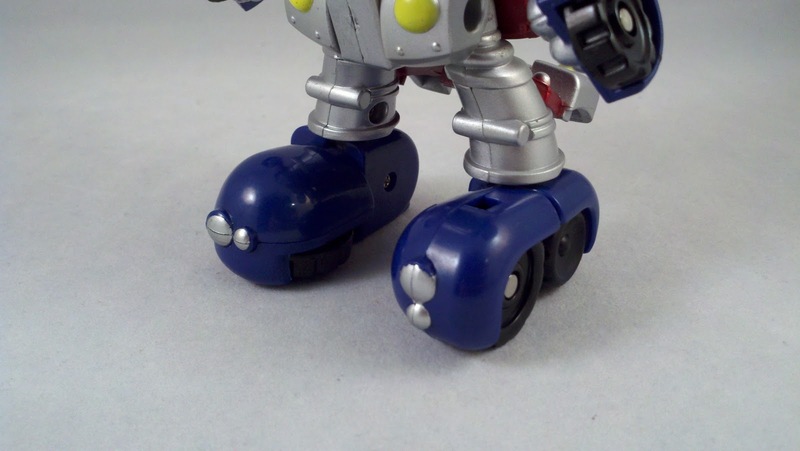 Since this is a Japanese based figure, the driver's side is on the right. Once that's folded down, you're done. 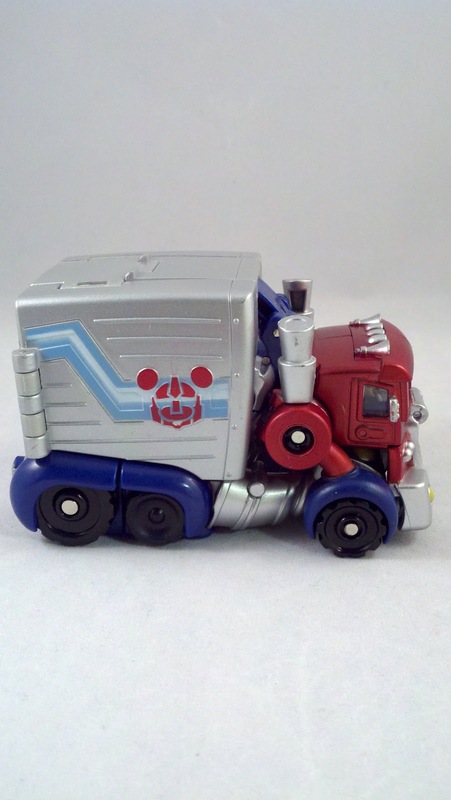 The Alt-mode has some very 'Disney' proportions. 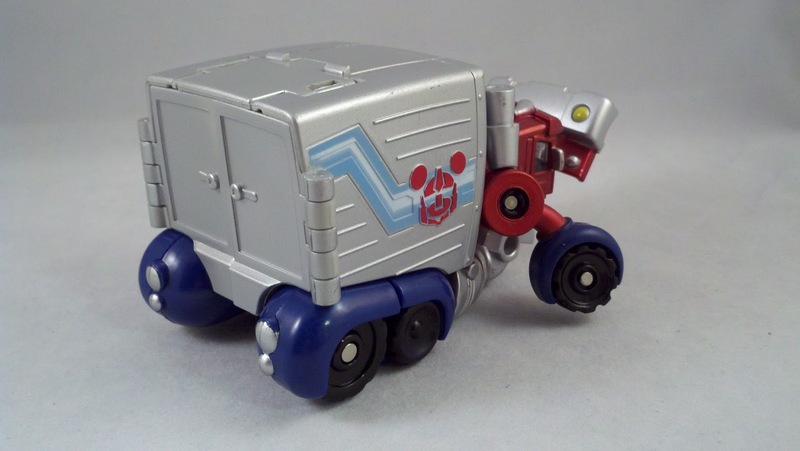 It looks like it rolled off an episode of Duck Tales. There aren't a lot of hard edges... most of the lines are curved or exaggerated. 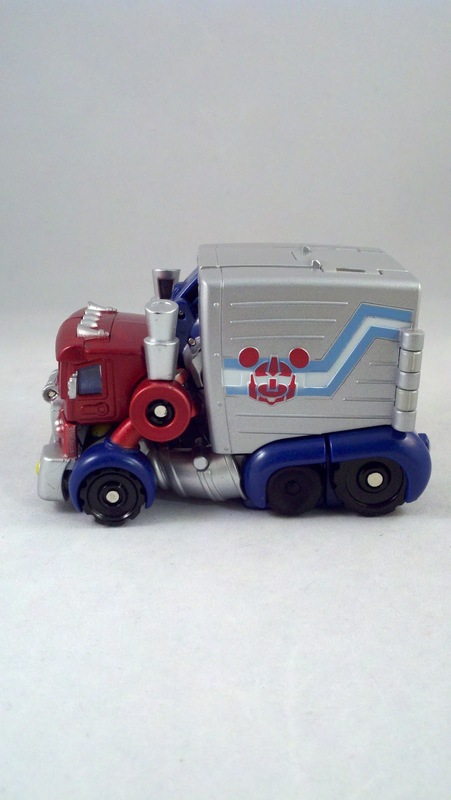 The colors definitely make this out to be Optimus Prime and the hybrid logo is a nice little touch. 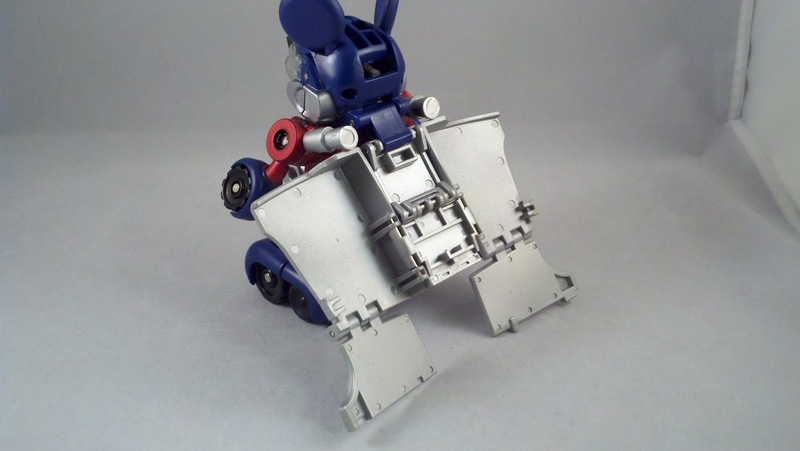 When this mold first came out, there was a second version made available, a monochromatic gray scale. Over the past 3 years, 3 other versions have been made available. Late in 2009, a Halloween version... which I thought was hideous. Late 2011 saw the release of the 'Standard' version. This was colored to actually mimic the original palette of Mickey himself. 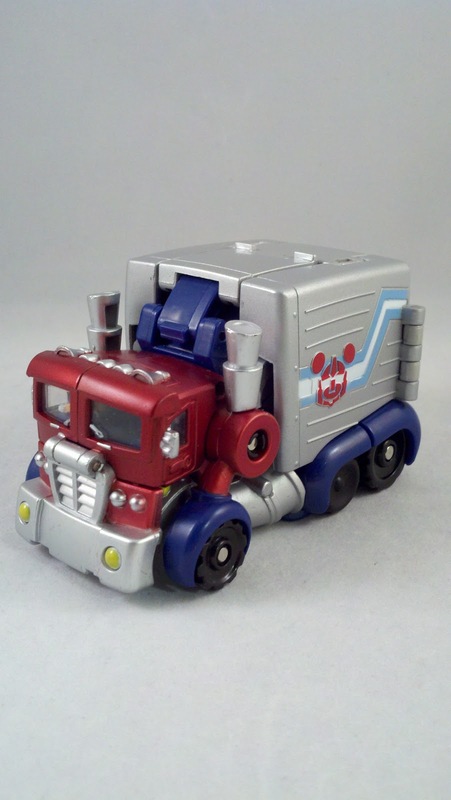 Not bad... but it's no Optimus. 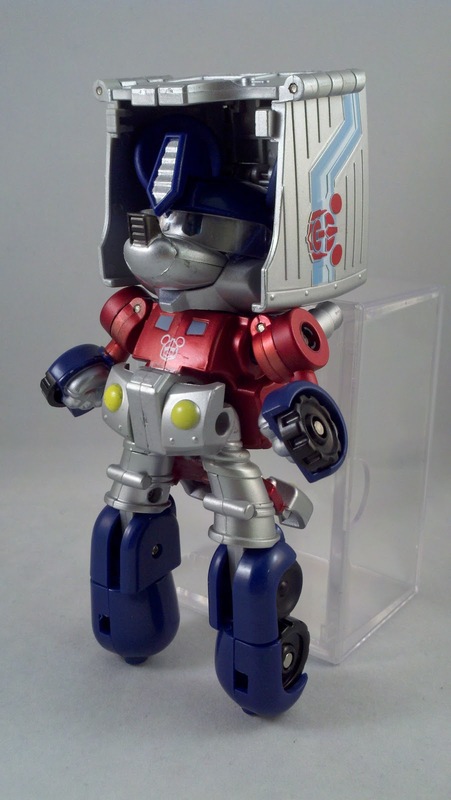 Paired with the release of the 'Standard' version... we received a Christmas version, decco'd in red, white, and green. Over all... this isn't a bad little figure. 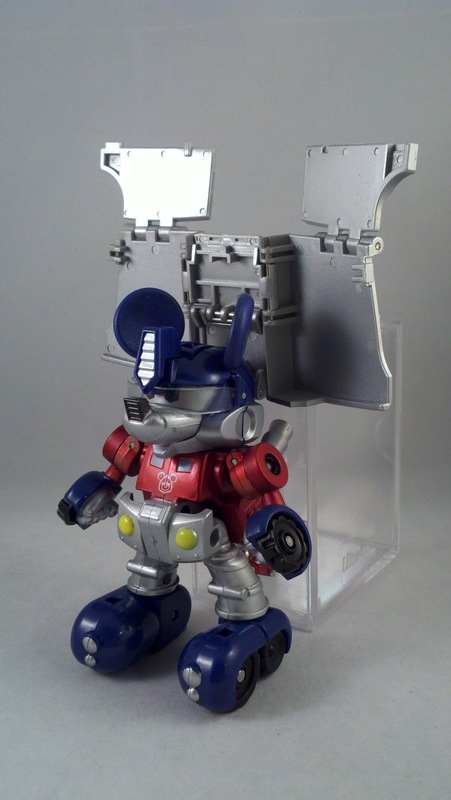 Like I said before, it is a very niche piece, fitting well into either an Optimus Prime or Mickey Mouse collection as a display piece. 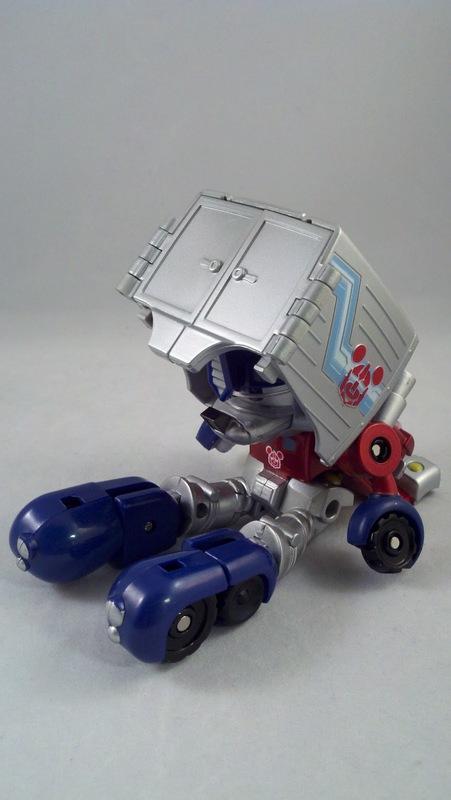 The play-ability is hampered by the lack of articulation, but I'm sure not many older kids will be playing with something like this. Younger children, perhaps. The paint apps on mine were a little sloppy in places... the silver on the nose has smudge marks and some other spots seem unfinished. But... no matter. 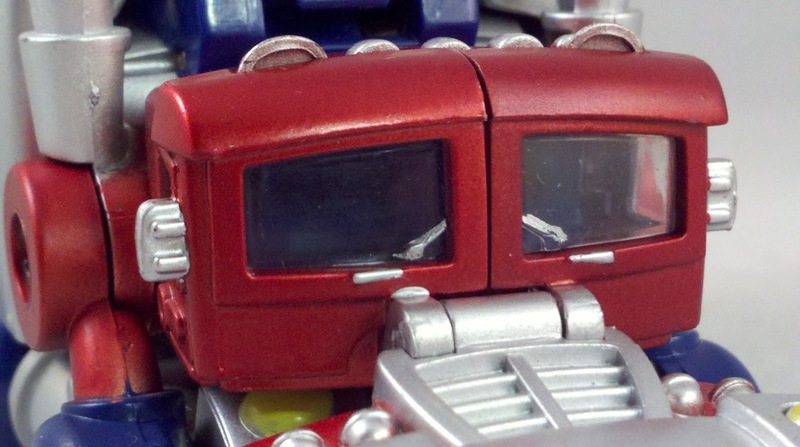 This is more than likely going to stay in Alt-mode on the shelf next to some other Alt-moded Optimus Primes. 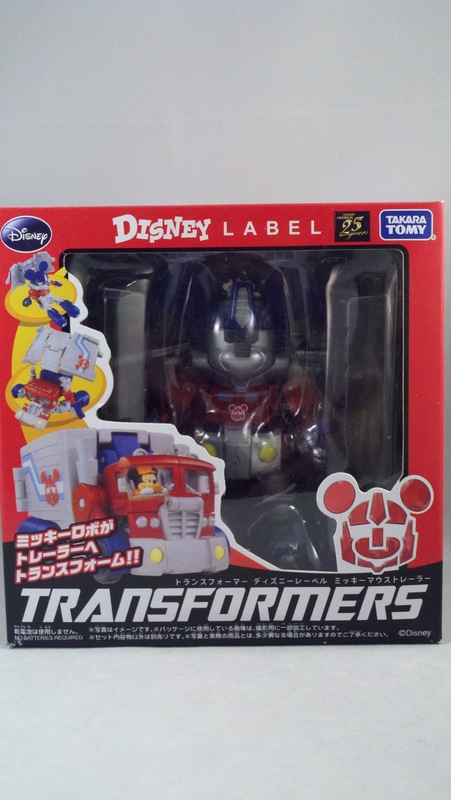 So, if you're a Disney or Mickey collector, or an Optimus Prime collector like me, this isn't a bad little piece to add to your collection. And right now, you should be able to find him at a decent price. My 2 originals, I paid near $100 for both. Finding this one at a toy show cost me $7. I hope you can score one for just as little. 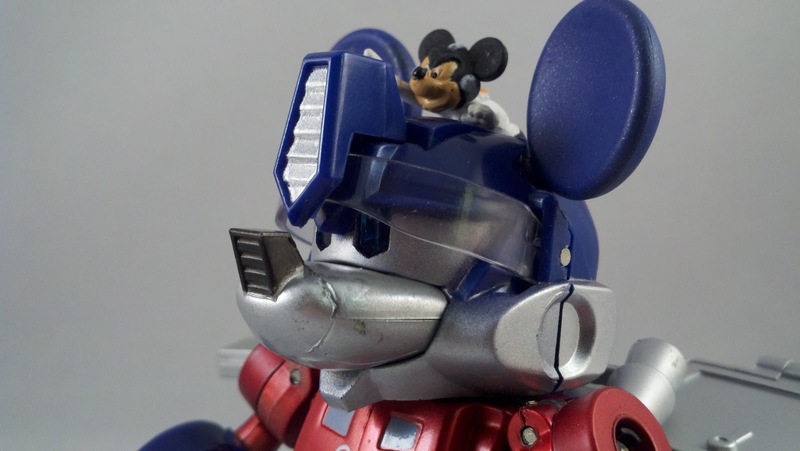 Pics, review, and 89 years of Disney magic by Scion of Primus.